A few cool things happened this past week. 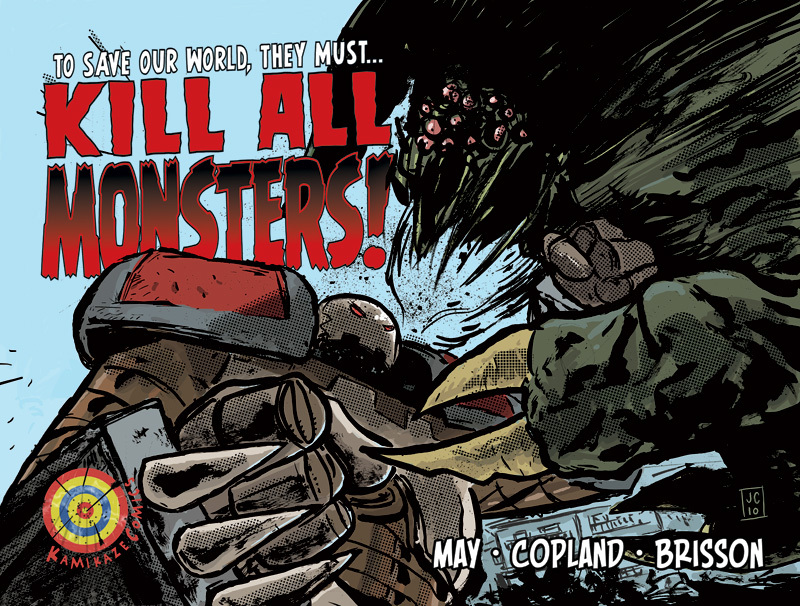 As announced on the Kill All Monsters! blog and Jason Copland's blog, we’re printing a very limited edition KAM ashcan. Depending on how quickly the printer works, Jason will be taking copies to ECCC in early March and I’ll have some a couple of weeks later at C2E2. If there are any still left, I’ll take some to SpringCon in May as well. If you’re not going to be at either of the March shows and don’t want to take your chances about SpringCon, the best way to get yours is to contact Jason either at j(dot)copland(at)telus(dot)net or through Twitter. The ashcan will have 28 pages (the entire first chapter of the story) of black-and-white interior art and a full colour cover, all in a landscape format. Again, this is going to have an extremely limited print run. Once they’re gone, they’re gone and Jason’s even going to include a small KAM ink drawing if you order from him. Price is only $10, which is a steal for Copland art. And speaking of Kill All Monsters!, I think it's been a couple of weeks since I mentioned that the webcomic is still updating with three new pages every Friday. If you haven't checked in for a bit, we've now seen some of the giant robots’ base and the Paris and Africa scenes are starting to connect. This week I also had a story accepted to a prose anthology that I'm pretty excited about. More details as I'm allowed to reveal them, but the theme of the anthology will be a lot of fun. And in equally mysterious news, I was also invited last week to participate in a webcomic anthology that's going to be a blast. Over at Robot 6, the latest Gorillas Riding Dinosaurs column was about the recent hullabaloo over creator-owned comics. I didn't mention Eric Powell's video, because while I agreed with a lot of what he was saying, I didn't think it was particularly helpful in the sense of offering any solutions for fixing the problems it identifies. As Tom Spurgeon says, that doesn't make it valueless, but I much prefer the thoughts of guys like Steve Niles and Skottie Young who have an approach they want to try. I too will have to get a copy of that bad boy. You are living the dream my friend.